Modifications in the leadership structure for youth organizations and refinements in the program for single adults were the major announcements of this year’s regional meetings. Held in June in most stakes and missions throughout the Church, these regional meetings are a once-a-year opportunity for all stake priesthood and auxiliary leaders to be introduced to the programs that will be implemented in each of the Church organizations during the next curriculum year. In the interim, these leaders then have the opportunity to train other stake and ward leaders in the responsibilities that will be theirs during the coming year. Conducting this year’s meetings were the Regional Representatives assigned to each region. Also in attendance were stake priesthood and auxiliary leaders; Melchizedek Priesthood quorum and group leaders; bishoprics, ward executive secretaries, and ward clerks; stake music chairmen; and stake public communications directors. Corresponding officers in the missions of the Church were also in attendance. Following an opening assembly in which a special filmstrip message from President Spencer W. Kimball was shown, an important morning session for the combined priesthood, Relief Society, and single adult leaders was held in which refinements in the Church’s programs for single adult members were introduced. The name “Melchizedek Priesthood MIA” has been discontinued, it was announced, and the new joint programs for Special Interests, Young Special Interests, and Young Adults are now referred to simply as the “Program for Single Adults.” More important than name changes, however, are organizational changes at both the stake and ward levels﻿—changes that underscore the important roles of both the priesthood and Relief Society leaders in responding to the needs of single members. The newly designated Stake Committee for Single Adults (formerly the Stake MPMIA Committee) has as its chairman a member of the stake presidency, and he is assisted by a member of the stake Relief Society presidency as vice-chairman. Similarly, the presiding officers of the new stake councils for Special Interests, Young Special Interests, and Young Adults have been renamed chairman and vice-chairman; and in addition to a high council adviser to each age-group council, a stake Relief Society Board member serves as an adviser to each council. At the ward level, a similar priesthood-Relief Society role in leadership is evident. A member of the elders quorum presidency serves as chairman of the Ward Committee for Single Adults (formerly the Ward MPMIA Committee), with a member of the ward Relief Society presidency as vice-chairman. Furthermore, the former ward male and female representatives for each age group have been renamed quorum representatives and Relief Society representatives, and they represent their respective groups on the stake councils. Thus it will be apparent that although the program for Single Adults remains a peer-led program, there now exists a strong and effective “team” of priesthood, Relief Society, and peer leaders at both the stake and ward levels, working together in a close relationship to identify and respond to the needs of single adults. Peer leaders in the Special Interest, Young Special Interest, and Young Adult programs will continue to plan and carry out their special activities as approved by local priesthood and Relief Society leaders﻿—programs such as home evening groups, interest groups, service projects, firesides, Pursuit of Excellence, and other social, cultural, and recreational activities. In a special afternoon combined session for bishoprics, stake Aaronic Priesthood Committee members, and the new stake Young Men and Young Women presidencies, details of the recently announced organizational restructuring of the Young Men (including Scouting) and Young Women programs were announced. These adjustments provide new strength and new balance in the leadership structure of the youth programs of the Church from the general Church boards to the ward Aaronic Priesthood quorums and Young Women classes. 1. Under the direction of a counselor in the stake presidency and the stake Aaronic Priesthood Committee, a new Young Men presidency is called to direct all stake Young Men activities, train ward Young Men leaders, and serve as stake age-group (priest, teacher, deacon) advisers. They also advise on other activities, including Scouting. 2. 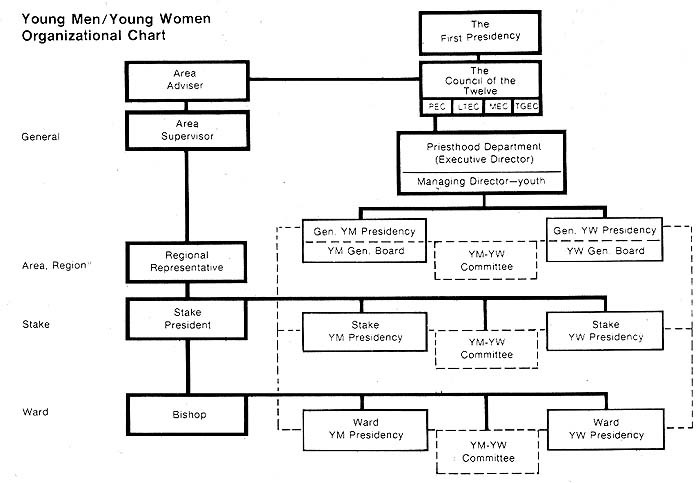 At the same time, a newly called Young Women presidency will direct all stake Young Women activities, train ward Young Women leaders, and serve as stake age-group (Laurel, Mia Maid, Beehive) advisers under the direction of the same member of the stake presidency. They also have the assistance and counsel of an adviser from the stake high council. 3. Together, these presidencies and their advisers form a stake Young Men-Young Women Committee that meets monthly for the correlation and supervision of all stake and multiward combined activities. Special youth committees may be called to plan and implement stake activities. 1. The former ward director of the Aaronic Priesthood is now replaced with a Young Men presidency consisting of the priests quorum adviser as president and the teachers and deacons quorum advisers as counselors. Each will have an assistant who will have primary responsibilities for Scouting activities for the respective groups. The members of the Young Men presidency serve as quorum instructors and assist the bishopric in giving general direction to the Young Men program of the ward. 2. Generally, the ward Young Women organization consists of a ward Young Women president, two counselors, class advisers, and a secretary. However, when local needs and circumstances call for a different arrangement, the Young Women presidency may consist of the Laurel adviser as president and the Mia Maid and Beehive advisers as counselors, or the Young Women president might serve without counselors or class advisers. 3. Together, the Young Men and Young Women presidencies and their respective quorum and class youth presidents form a ward Young Men-Young Women Committee to plan, coordinate, and implement all combined activities. Both the Young Men and the Young Women presidencies now serve under the direction of one counselor in the ward bishopric, whereas formerly all three members of the bishopric were directly involved in the Activity Night programs. This member of the bishopric is given responsibility for all youth programs in the ward, and in wards that affiliate with Scouting this may also include the Primary organization. It should be noted that although the entire bishopric is no longer directly involved in the activity programs of the Young Men and Young Women, they still maintain responsibility for the ecclesiastical affairs and spiritual welfare of each group. The bishop still serves as president of the priests quorum, and his counselors continue to directly supervise the teachers and deacons quorums. Similarly, the bishop continues to supervise the Laurels in his ward; one counselor the Mia Maids; the other counselor the Beehives. These members of the bishopric should develop close personal relationships with the youth for whom they are responsible and regularly interview each young man and young woman. The former “Youth Activity Night” is now referred to as “Mutual.” It is held weekly on a night other than Sunday or Monday and is presided over by the assigned member of the bishopric. 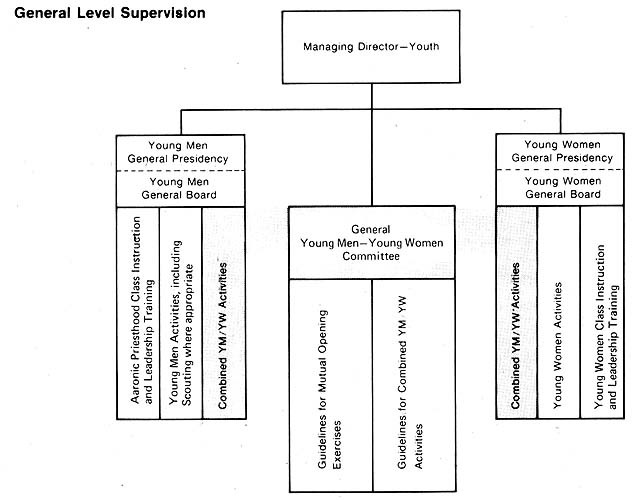 A significant change announced at regional meetings is that Service and Activities Committees at the general, stake, and ward levels are now referred to simply as the “Activities Committees”; furthermore, they are no longer Young Men-Young Women committees alone but now serve all Church organizations at every level, under the direction of appropriate priesthood leaders. These modifications in the youth programs serve to relieve stake presidents and bishoprics of many of the operational demands on them without compromising their responsibility for the young men and women of the Church. The changes also reinforce the active involvement of youth while making it possible to more significantly involve adults in giving direction and counsel without “taking over” the program or “smothering” the initiative of the youth. Just as exciting as these program modifications was the introduction of a number of new published materials specifically designed to help adult and youth leaders implement the new Young Men and Young Women programs. The Young Men leaders received copies of three new publications﻿—the new Aaronic Priesthood-Young Men Handbook, the Aaronic Priesthood Quorum Guidebook, and The Activity Book—along with an explanation of how these publications work together to help strengthen quorum activity programs. 1. Learn the gospel and build testimonies of Jesus Christ. 2. Give welfare and temporal service. 3. Prepare for and give missionary service. 4. Give genealogical and temple service. 7. Activate young men of quorum age. 8. Build proper relationships with young women. 9. Prepare for eternal marriage and fatherhood. When “priesthood purposes” are clearly identified in this way, activities can be more directed, and truly worthwhile activities are more likely to happen. It was further emphasized that Scouting activities, as well as regular quorum activities, should also be keyed to priesthood purposes. In this approach to making activities more meaningful, the Aaronic Priesthood Quorum Guidebook becomes an ideal resource. It contains information and training materials which enable youth leaders to plan and carry out a complete quorum activity program. A prepared, year-long program is included with each suggested weekly activity keyed to a specific activity in The Activity Book. The Activity Book is an outstanding new collection of hundreds of suggested activities that are appropriate for Young Men, Young Women, and combined Young Men-Young Women functions. It may also be used as a resource by other priesthood and auxiliary organizations, families, and individual members of the Church. It is especially valuable because of its indexes. One index groups every suggested activity under one of the eleven “priesthood purposes,” making it very simple to locate particular activities for each week of planning. The Aaronic Priesthood-Young Men Handbook is an additional resource for stake and ward priesthood leaders in administering the Aaronic Priesthood and Scouting activities. The Young Women leaders received seven new publications at the regional meetings, including the new Young Women Handbook, the Young Women Guidebook, the same Activity Book used by the Young Men, My Personal Progress, and new manuals for the Laurel, Mia Maid, and Beehive classes. 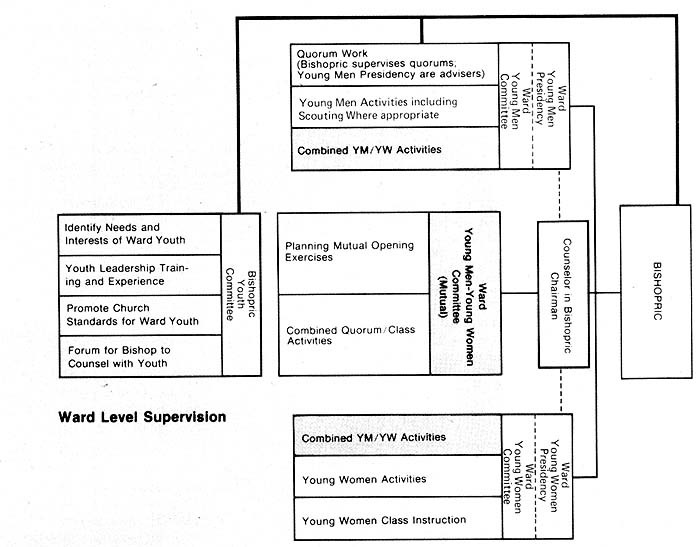 The Young Women Handbook outlines the organization and basic procedures and policies of the Young Women program. The Young Women Guidebook is a new and comprehensive training resource that has been prepared to train Young Women class leaders in the duties and responsibilities of their callings. Incidentally, the production of the new guidebooks for the Young Men and Young Women represents a significant new direction in the training programs for the youth of the Church. Never before has such attention been focused on leadership training for Aaronic Priesthood quorum and Young Women class presidencies. These outstanding new guidebooks make it possible as never before for youth leaders to learn how to preside, how to activate and involve class members, and how to organize activities. 4. Recreation and the world of nature. 5. Cultural arts and education. 6. Personal and social refinement. Thus every activity may be planned to have a direct bearing on each young woman’s personal progress and provide for a balance of experiences. Each young woman will receive a copy of the beautiful new book entitled My Personal Progress to keep and use all through her years in the Young Women program. In it she can set down her own goals and plan her own personal progress in each of the six areas of focus named above. Up-to-date reviews culminate each year when the young woman receives a Certificate of Progress that shows what she has done to fulfill her goals for that year. Her years of progress in the Young Women program may culminate in her receiving the Special Young Womanhood Recognition certificate and medallion as a Laurel. With these new publications, the youth and adult leaders of the Young Men and Young Women are truly surrounded with resources to help them in seeing that every youth increases his or her knowledge and testimony of the gospel of Jesus Christ. 1. Strengthening individual conversion to gospel principles through individual study, quorum instruction, and service. 2. Helping fathers to give effective priesthood leadership in the home. 4. Improving each priesthood holder’s performance of his general duties and special assignments relating to his priesthood office. In connection with objective number 4, it was emphasized that all who bear the priesthood have personal responsibility for being actively engaged in the basic priesthood responsibilities related to the family and to the observance of gospel principles. Although some priesthood groups are assigned certain special responsibilities, all priesthood holders have general responsibilities in the basic priesthood programs: welfare services, missionary work, temple and genealogical activities, and home teaching when assigned. Elders, seventies, and high priests have equal responsibility for personal and family preparedness and for participating in Church preparedness. In the morning priesthood session, the four welfare services areas that will be focused on during 1977–78 were introduced: literacy and education, social-emotional and spiritual strength, the bishops storehouse system, and LDS Social Services. A case study was employed to demonstrate how Church welfare services are brought to bear when a family is in need. In particular, the bishop’s responsibility to provide short-term temporal help was stressed, as opposed to the elders quorum president’s responsibility in prevention and rehabilitation. The Relief Society presidency’s specific duties in welfare services were also pointed out in detail. The activation of elders and prospective elders received the most emphasis in the elders departmental session. Two phases of activation were presented: (1) elders quorum resources for activation, and (2) a new missionary plan entitled “Special Plan for Proselyting Part-Member Families,” which was also covered in the seventies departmental session. In keeping with the fact that the Church has addressed itself to missionary work with a strong new emphasis in recent years, a challenge was issued to every stake leader, bishop and other ward leaders, and especially fathers to start a tradition of every young man going on a mission. Additional stress was laid on the importance of fathers interviewing their sons regularly beginning at an early age, devoting family home evenings to missionary preparation, reading the scriptures and praying together with their children daily, encouraging the home teachers to follow up in their part of the sons’ missionary preparation, and further preparing their sons financially, socially, physically, educationally, and spiritually for missions. The genealogy presentations reemphasized the basic elements of priesthood genealogy and temple work: (1) sacred family records, including personal histories; (2) temple ordinances for the living and the dead; and (3) genealogical research and name submission, especially as they are organized through the immediate family (the family home evening unit), the grandparent family (the father, mother, and their married and single children and any grandchildren), and the ancestral family organizations. The responsibility of high priests group leaders and ward priesthood executive committees in promoting genealogical work was noted, and the fact that individuals who do genealogy work and submit names will be more inclined to attend the temples was underscored. The theme of the day’s Relief Society departmental sessions was “The Circle of Relief Society Sisterhood”﻿—emphasizing the involvement of every Latter-day Saint sister in Relief Society and a strong outreach to nonmember women through personal example developed by spiritual and provident living, through compassionate service and developing leadership skills, and through missionary work and strong community involvement. It was emphasized that each sister can help strengthen her community by working to strengthen her own family, by exemplifying the principles of righteous living, by becoming knowledgeable in current affairs, and by becoming involved in the support of righteous causes and political activity wherever opportunity permits. Relief Society training workshops at the regional meetings included instruction in how to make better lesson presentations, how records can be used as a resource in problem solving, and the role of sisters﻿—visiting teachers in particular﻿—in making contact and associations with nonmembers. The Primary departmental sessions concentrated on the challenge to “Strengthen Each Child,” building upon the Primary’s hundred-year tradition of preparing children to live gospel principles. During these sessions, instruction was given in how to develop leadership skills and how to sit in counsel. Guidelines for implementing the Primary program were also presented. The Primary celebrates 100 years of service to the Church in 1978, and the celebration for the coming year involves more than, just learning about programs and leaders of the past; it also includes activities, child participation, and a rededication of leaders and teachers to the purposes of Primary. In the early days of Primary, the climax of each year was a “Primary Fair.” Now, almost 100 years later, Primary leaders are encouraged to plan a Primary Fair as a highlight to the 1977–78 Primary year in each ward and branch. For this purpose a new booklet, Primary, Birthday Celebration Ideas, has been prepared. A new song, “A Happy Birthday to the Primary,” has been written and is featured in the booklet. In addition, a brand new Primary Handbook was introduced, and also an excellent new resource for improving the quality of teaching and the relationships between teachers and children, The How Book for Teaching Children. The How Book includes helpful techniques and suggestions and reviews the physical, mental, social, emotional, and spiritual characteristics and needs of each age group. The Sunday School departmental presentation centered around two important challenges: (1) activation, and (2) improving teaching. It was pointed out that in most areas, adult attendance in Sunday School is the lowest of any age group. Therefore, the emphasis was placed on activation of the family—encouraging all adults to attend Sunday School with their children. For the purpose of improving teaching, two new procedural refinements were introduced, the first of which changes the primary responsibility of Sunday School officers from administration to teaching. Sunday School presidencies and Junior Sunday School coordinators are now to assume full responsibility for the quality of classroom teaching, rather than leaving teacher improvement primarily in the hands of inservice leaders. This means that each Sunday School counselor and Junior Sunday School coordinator will have direct involvement in classroom visits, goal selection and stewardship interviews, etc., for all teachers under his or her supervision. Inservice leaders and assistant librarians are still available as resource persons, however. Ward faculty meetings need not be held monthly, but only as the need arises. Secondly, it was announced that two of the four quarterly stake leadership meetings will include stake Sunday School teaching workshops, one near the beginning of the curriculum year, the other at midyear. All stake and ward Sunday School officers and teachers will attend these workshops to receive specific training in successful teaching methods. New to the regional meetings this year was a departmental session for stake music leaders. The session was devoted primarily to instruction in organizing music training programs within the wards and stakes. Three new resource publications were also presented: (1) Activity Songs and Verses, a supplement to the children’s songbook Sing With Me; (2) Hymn Preludes for Piano, a collection of nineteen short hymn arrangements written as prelude music; and (3) Training Course for Conductors, an outline for a six-week course in basic conducting skills. 1. Communicating to the public accurate images of the Church, its programs, and its members. 2. Assisting the missionary program through various approaches that take into account the needs and interests of the public. 3. Improving the cultural environment of our communities by combating the degrading influences that cause moral pollution. In most regions, the noon break for lunch featured a series of cultural presentations, including such things as art displays, homemaking skills demonstrations, crafts displays, performances by musical and dramatic groups, and other events. Many stakes were tremendously successful in their efforts, and in areas where it was convenient to do so, stakes held Friday evening cultural presentations for the regional membership. Some of these presentations featured music, dance, or drama festivals, roadshows, variety and talent shows, speech festivals, etc. The Regional Representatives encouraged the use of cultural arts throughout the coming year in each family, ward, and stake and urged leaders to begin planning now for the 1980 Sesquicentennial Celebration (150 years since the restoration of the Church), which promises to be a great opportunity for cultural events. Looking back, one cannot help but be impressed with the regional meetings held throughout the Church. They are a means of placing instructions from the Brethren into the hands of local leaders of the Church worldwide﻿—uniform, consistent instructions, received by all leaders in each region at the same time. Priesthood and auxiliary leaders who attended are now busy training and instructing other local leaders in preparation for the new Church curriculum year.